Open dates! April 26-May 4! Get FREE NIGHTS! Pay for 3 nights, stay for 4! Pay for 4 nights, stay for 5! Pay for 5 nights, stay for 7! Enter coupon code "FREE" when booking on our website and start saving today! (Good on new reservations only. Cannot be combined with any other special or promotion. Other restrictions may apply). 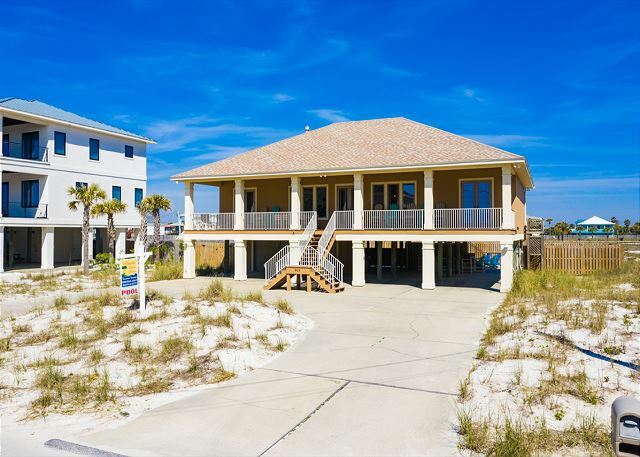 Luxury four-bedroom, 3.5-bath home with beautiful beach views and a pool. 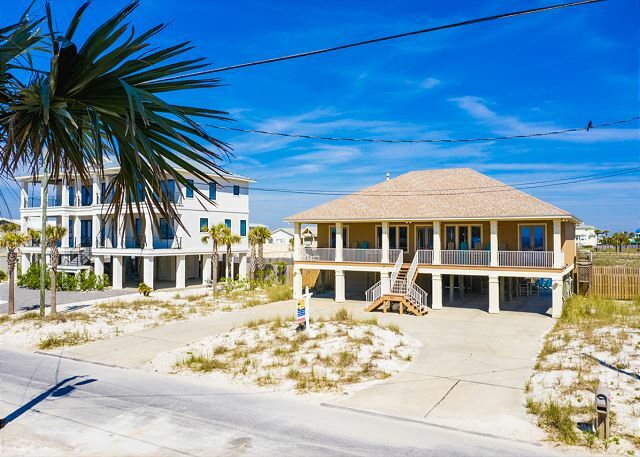 This home has a large covered porch across the beach facing side of the home offering the ideal place to enjoy the refreshing ocean breeze and the sounds of the waves breaking on the shore. The master bedroom offers a king bed, luxurious private master bath and access to the gulf facing porch. The second Gulf side bedroom has a king bed. The third bedroom has a king bed and private bath and the fourth bedroom offers two sets of triple bunks. The living room has a queen sleeper sofa; bring the total sleeping to 14 if needed. The well-equipped kitchen offers granite counter tops, upgraded appliances, and bar with seating so that guest can gather around and socialize with those who are working in the kitchen. We had a great experience from the day we arrived to departure! It was the perfect home for our three families (including 6 kids). We had plenty of space, a perfect kitchen for mealtime and quick access to the beach. Only thing we would change is having the pool heated, as it was still a little cool for swimming. Thank you for taking time to post your review about your stay at 905 Ariola Drive! We're so glad you enjoyed your stay and we look forward to your return! Fabulous home. We enjoyed every moment. Looking forward to our next visit. Property management personnel are extremely helpful and responsive. Kudos to PBH staff. We're so glad to hear that you enjoyed your stay at 905 Ariola Drive and happy that our staff met your needs. We appreciate the business and look forward to your return! We needed a house big enough for 12 people including 7 kids (ages 7-15), close to the beach and with a pool. This house met all expectations! Knowing kids would not last all day at the beach, the pool was an absolute hit and they probably wouldn't have enjoyed vacation as much without it. They loved the triple bunk beds. The layout of the house is great with 2 bdrms on one side and the other 2 on the other side, so it never felt crowded. Also, the kitchen had nice cookware to use. About the only thing I suggest would be to add a ceiling fan in the kids room. Other than that, it is exceptional and would definitely rent this house again! Paradise Beach Homes is also great, never had any issues from reserving to checking out...when we got to the airport, we realized we we're missing two bags with small items. I called them and they were so helpful to collect both bags and mail them to us. Thank you for posting your review! We're so glad to hear that you enjoyed your stay and that the kids enjoyed the pool. And we appreciate the recommendation about putting a fan in the kids room. Our only concern is that the top bunk could be too close to the fan and the child that stays on the top bunk could get hurt. It's possible that the bunks would be far enough away from the fan though so we will definitely look into that. Thank you for staying with Paradise Beach Homes and we look forward to your return! We started out by not liking the property we initially rented. Paradise Homes went out of their way to find a new property and put us in this home without a hitch...boy was it worth it!!! Thanks Paradise for a great rental, great customer service, and an overall great experience. This home had everything we could ask for and a very clean environment. We really enjoyed the pool and the easy walk to the beach. Thank you for staying with Paradise Beach Homes! We are so glad that you enjoyed your stay and look forward to your return! First off, Paradise Beach Homes worked with us to find this stunning home along a beachfront drive when our previous rental became unavailable just weeks before our vacation due to a rental owners illness. We couldnt be happier with the prompt customer service at Paradise Beach Homes, and we were greeted on arrival with very friendly staff who made the experience undoubtedly pleasant and professional! Ariola 905 is a very clean, updated home with a fun yet functional beach decor. Views from the front balcony satisfied our yearn to be beachside even though we were across the street. The newly installed pool was clean and kid-friendly, and it came to be a great way to unwind after spending the day at the beach, which is accessed one home down with a less than 5 min walk to the waterfront. The master bedroom and bathroom was stunning and felt like home! The additional 3 bedrooms (one with a private bath) were clean, roomy, and comfortable. We didnt use the bunk bed room, but it would be a perfect room for a large family with many kids or even function with two (or three) families sharing the property with small kids. The kitchen had everything we needed to prepare and cook, from breakfast to dinner. Onsite laundry was a plus! The beach chairs/toys in the garage came in handy. We even played a few games that were on site! Everything about this home made for a smooth, hassle free vacation! Thank you for choosing Paradise Beach Homes. We look forward to seeing you on your next trip to Pensacola Beach! Wow!!!! Our family vacation was AWESOME. We enjoyed this rental property; did not want to leave. We have shared our experience with so many people. This was a great house for a large family to stay. We had 6 adults and 2 kids. Yes if you had that up and look at the bedroom layout, there were 2 adults that had to sleep with 2 kids in bunk beds. It was such a fun experience. You feel like a kid again getting to sleep in a bunk bed. The house had such a great layout and was very close to the beach. It also had a great view of the gulf from the big front porch.